Clean Well Water Report: What is Best Way to Remove Chlorine, Rust and Odors from Chlorinated Well Water? What is Best Way to Remove Chlorine, Rust and Odors from Chlorinated Well Water? "I recently purchased a Model 400 pellet feeder and while it did completely get rid of the sulfur odor, now we have a chlorine smell to the water. What is the best to get rid of the chlorine? We have two kids, so four in our home, 2 bathrooms. We have an old water softener that still works fine, and the water is pretty good, just an annoying chlorine taste and odor, like a slight bleach smell." Glad to hear the Model 400 is working out for you. One problem or issue with the pellet feeders is that the minimum chlorine residual they can inject, can be high. For example depending on the size of your pressure tank, the Model 400 can often inject 5 to 10 ppm of chlorine. If you had sulfur odor (hydrogen sulfide gas) in the water that ‘used up’ 7 or 8 PPM of that chlorine, you still may end up with 1 – 2 PPM of chlorine left in the water. The solution is to use a small contact tank after the pellet feeder, and then a simple carbon backwash filter. The contact tank will allow some time for the chlorine to further react with the odors and then dissipate so the chlorine residual left over, will be lower. A carbon backwash filter after the contact tank will remove any final chlorine odor or taste remaining, and polish the water making it very clear. The result is very clean, odor-free, chlorine-free water throughout your home! 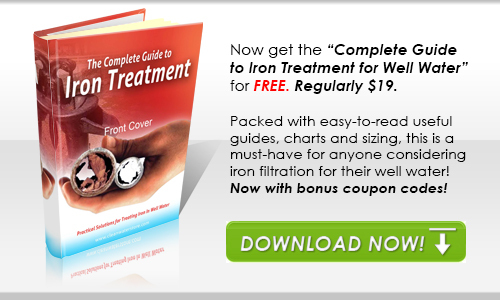 If you have a small amount of iron or rust, the carbon backwash filter will eliminate that as well. However, if your iron levels are higher than 1 – 2 PPM, or you have manganese, we recommend a Pro-OX Iron Filter after the contact tank, and the carbon filter last in line. 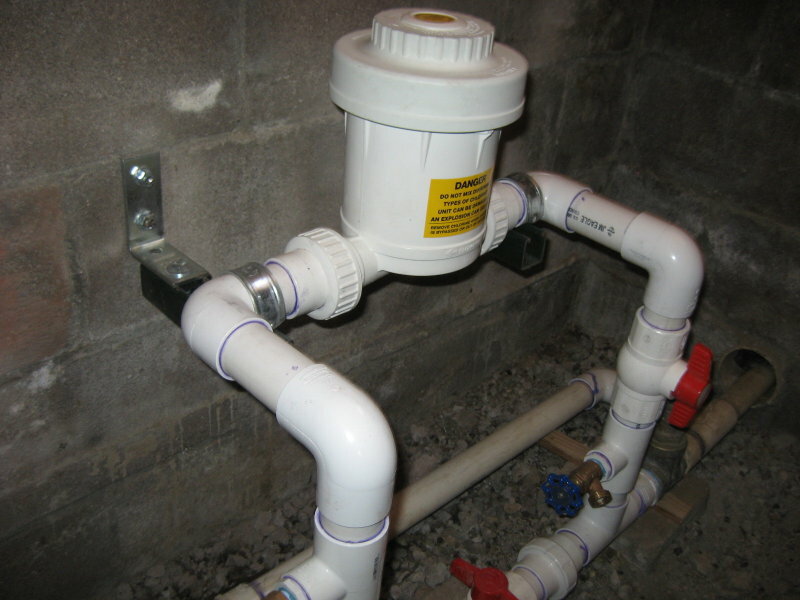 The carbon filter will also protect your water softener from being fouled or degraded by rust or chlorine residual. The CWS-1354 tank is a durable easy-to-install retention tank designed to provide optimum contact time during chemical treatment. These lightweight seamless totally non-corrosive retention tanks are ideal for new and replacement installation where durability is at a premium. 100% non-metallic polymer materials. Impervious to chemical attack. Max Pressure: 125 PSI, most other tanks can take 75 PSI maximum. Dimensions: 13” Diameter x 54” Tall - Includes ¾”, 1”, or 1 ½” Inlet. 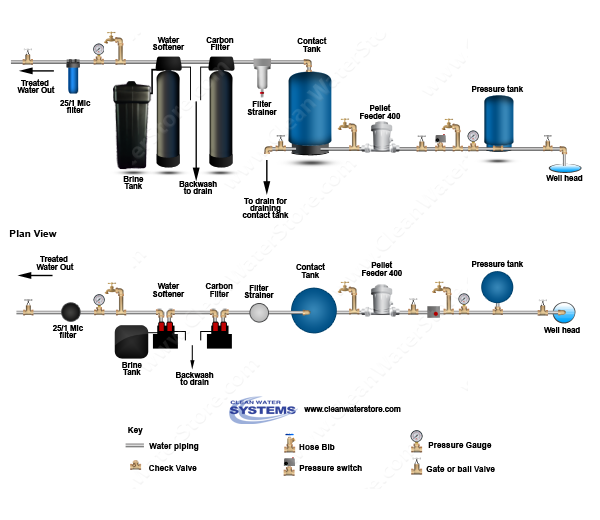 All the filter media you need for the system is included. Excellent for use in removing residual chlorine residuals from water once injected, along with improving overall tastes and odors. Long lasting & durable this Coconut Shell Carbon typically lasts for 4 - 6 years and is easily replaced. Dimensions: 10” Diameter x 61” Tall with control valve. ¾” or 1” pipe connectors and bypass is included. We also provide full installation and start-up guides directly to you and are available for Tech-support.